Irish embedded silicon developer DecaWave has shipped a million chips using UltraWide Band technology for indoor location sensing. This reflects the increasing demand for accurate micro-location solutions from end users and customers within Internet of Things (IoT), consumer and industrial markets, and the company is aiming to reach five million units shipped in the course of next year. Decawave's IR-UWB wireless technology can identify the specific location of any object or person within a guaranteed indoor location accuracy of 10 cm, and is being used for connected homes, phone accessories, drones and sports analytics; industrial with connected buildings, factory automation and healthcare, as well as automotive as Decawave technology will be embedded in cars in 2017. The industrial market has been the first market to use the technology and several customer systems are already in the field. Decawave has also created an ecosystem of industrial partners that includes 15 companies who can deliver software, hardware or turn-key systems to end customers. The consumer products – some of which were presented at CES in January– are starting to ship now like the Pixie tags, which allow customers to accurately locate, protect and organize their valuables. 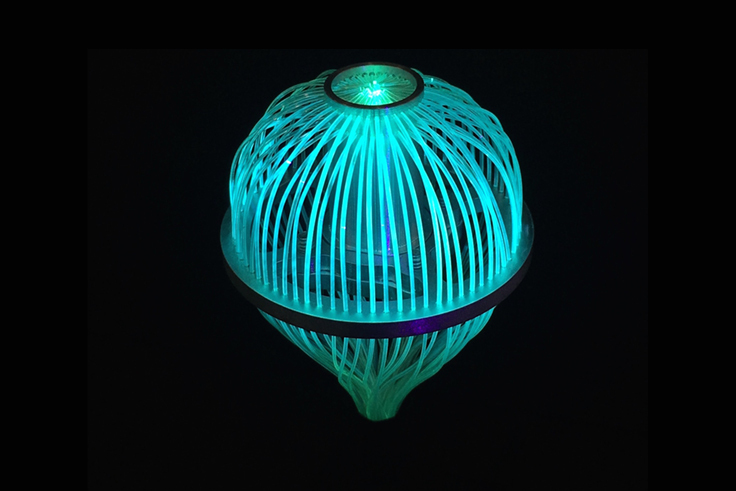 It was featured in Jaguar’s connected car demo and enabled the Intel drone orchestra show during the keynote at CES. The consolidation in the power industry continues at speed with Analog Devices buying Linear Technology for 14.8 bn. The combined company will have a revenue approaching $5 bn in analogue and power devices making it the second largest after Texas Instruments. TI has revenue of $8.3 bn, so there's still a long way to go, but it puts Analog well ahead of both Infineon and Skyworks, according to data from IC Insights. One of the interesting things is the role of Dust Networks, which Linear bought in 2011 for its proprietary ultra-low power mesh networking technology that fits well with the Internet of Things, especially with energy harvesting where Linear also supplies key power management chips. Analog doesn't have much of a role in low power RF transceivers, but the Dust technology is a good fit for the sensors and data acquisition chips where Analog dominates, creating a complete reference design for battery-basked and energy harvesting IoT wireless sensor nodes. Linear Technology shareholders will receive $46.00 per share in cash and 0.2321 of a share of Analog Devices common stock, valuing Linear at $14.8 bn. “The combination of Analog Devices and Linear Technology brings together two of the strongest business and technology franchises in the semiconductor industry,” said Vincent Roche, President and Chief Executive Officer of Analog Devices. “Our shared focus on engineering excellence and our highly complementary portfolios of industry-leading products will enable us to solve our customers’ biggest and most complex challenges at the intersection of the physical and digital worlds. We are creating an unparalleled innovation and support partner for our industrial, automotive, and communications infrastructure customers." 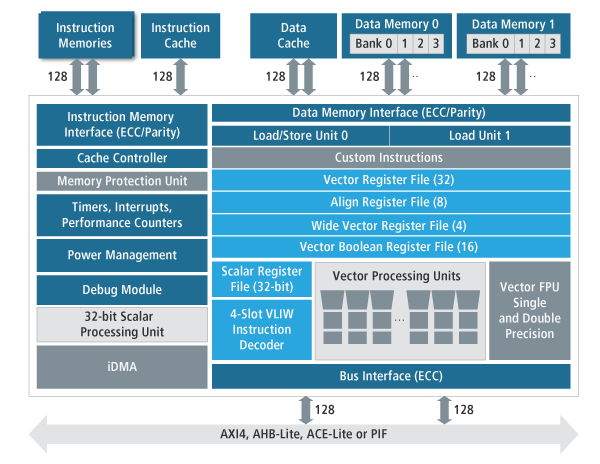 It used to be thought that VLIW (very long instruction word) compute engines were hard to program and not really for the embedded market, but Cadence Design Systems is using it to span a wide range of applications from automotive to the Internet of Things (IoT). The latest Tensilica DSP core, the Fusion G3, (above) can be programmed in C or C++ rather than a separate DSP tool chain, to integrate audio, imaging, communications, sensor and embedded DSP in a wide range of applications from radar in cars to natural language interfaces in IoT. The Tensilica Fusion G3 DSP is built on the existing Xtensa real-time control processor and has a flexible memory subsystem, optional integrated DMA controller and memory protection unit (MPU). It is a hefty beast, based around a 128-bit, 4-slot VLIW architecture with a high performance 11-stage DSP pipeline with with quad 32-bit integer MACs and quad single precision 32-bit floating point Fused Multiply Adds (FMAs) or MACs. This provides up to 24GLFLOPS@1GHz for compute-intensive applications such as mid- to high-end audio pre and post processing, radar and low end image processing. The power consumption will of course depend on the process technology and clock speed. Cadence has long supplied function-specific DSPs for audio, imaging/vision and baseband signal-processin, but fast-evolving markets like automotive and IOT mean a narrowly-focused DSP is not always the best choice, said Mike Demler, senior analyst of The Linley Group. This is creating an emerging demand for a high performance, multi-purpose DSP which supports a wider range of data types and operations, including both fixed and floating point, that can handle many different signal processing tasks, he says. The Fusion G3 DSP was co-designed with a lead customer and has already been taped out in silicon earlier this year. It will be available for broader licensing in October 2016. Tensilica processors have been licensed by 17 of the top 20 semiconductor vendors, have over 250 licensees, with thousands of different cores in silicon. 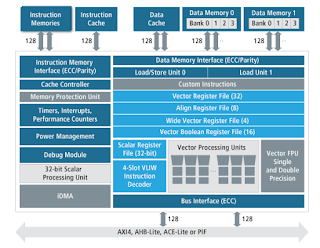 The Xtensa architecture is one of the most popular licensable processor architectures, shipping over 3bn cores in 2015, in products spanning sensors to supercomputers. 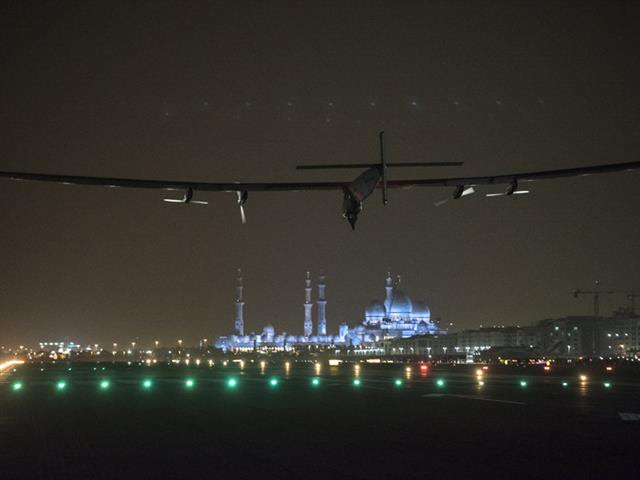 The next version of the first solar powered aircraft to travel around the world will be autonomous, after overcoming key problems with its lithium ion batteries, writes EETimes Europe. Solar Impulse 2 landed back in Abu Dhabi yesterday after a 15 month round trip of 17 legs and 40,000 km. The prototype of the autonomous version, supported by ABB and Solvay, is planned for 2019 as an aerial basestation similar to Facebook’s Aquila. The craft uses 17,248 photovoltaic cells that produce a peak power of 66kW from the 270m2 coverage. These supply four 41kWh lithium ion batteries that weigh a total of 633kg, a quarter of the total weight of the craft at 2.3 tonnes. Four 41kWh motors drive the aircraft at speeds up to 140 km/h (87mph) and up to 12,000 m (39,000 ft). The lessons for the embedded technology development from the battery management system and the autopilot will be applied to the autonomous version, and the power figures suggest there is sufficient additional power for the basestation and communications links. This reinforces the trend for more analytics and data centre integration with embedded IoT technology, as demonstrated by the recent acquisition of chip designer ARM by Softbank of Japan. Just as distributors had a line card of a wide range of devices so they could sell those into a design and get more value out of the sale, so now the additional value comes from having the vertical services from the sensor node through the gateway and up into the cloud. So Avnet's Silica wing of the company has added Arkessa, a leading M2M managed services provider; Spica Technologies, who offer cloud based service solutions to capture, manage and present data; and UbiquiOS, supplier of embedded software to manage local connectivity and connectivity to the cloud. It has also signed an additional agreement with Sierra Wireless for its entire device to cloud offering so that it now provides SIM and Connectivity services, as well as IoT cloud platform services, in addition to the existing hardware cellular module business across Europe. Avnet Silica is looking to become a key partner for customers looking for the complete edge-to enterprise solutions, from the chip level design, right through development and manufacture, ending in connected intelligent devices that can be deployed, monitored and managed out in the field. The UbiquiOS connectivity platform is a user-friendly, cost effective, and secure software stack for embedded wireless applications. The stack can run on bare metal or in a RTOS and has been optimized for Cortex-M, Intel Quark and Microchip PIC32 MCU’s and supports BT, BLE, WiFi and cellular transceivers. In addition, the stack makes for easy integration into the leading cloud platforms for presentation of data and management of networks. “The breadth of semiconductor solutions offered by Avnet Silica combined with UbiquiOS’ unique connectivity stack with interoperability, compactness and ease of use will allow developers the widest range of IOT development options in the industry,” said Rusty Stapp, vice president of business development at UbiquiOS. The partnership with Arkessa adds secure global connectivity service to Avnet’s integrated hardware and embedded software portfolio. This gives OEM companies the ability to design, develop and connect smart sensors and embedded devices and gateway solutions over cellular networking technologies, through to cloud and enterprise software applications. The Arkessa service offering enables OEMs and end users to access global radio network connectivity through a single provider. Managing large scale and multi-network connections via a single user interface simplifies product development and deployment. “Avnet Silica and Arkessa are both dedicated to making it as easy as possible for customers to connect and scale their IOT products and solutions wherever they are in the world,” commented Andrew Orrock, Arkessa CEO. “Avnet Silica’s Visible Things Platform and their commitment to innovation coupled with Arkessa's proven track record makes this a compelling partnership for IOT solution development and operation in the field whether it be high-data or low-data applications." Spica Technologies offers its devicepoint IOT application framework, which provides a set of composable services that can be configured to deliver any number of IOT solutions. Enabling customers to connect their devices into the cloud, using secured encrypted messaging, user security, white labelling, a comprehensive set of dashboards, and the ability to quickly and simply generate external reports and analytics, all in a monthly subscription cloud-based platform. Spica also offers “Professional Services” to help customers prototype, pilot and launch solutions. 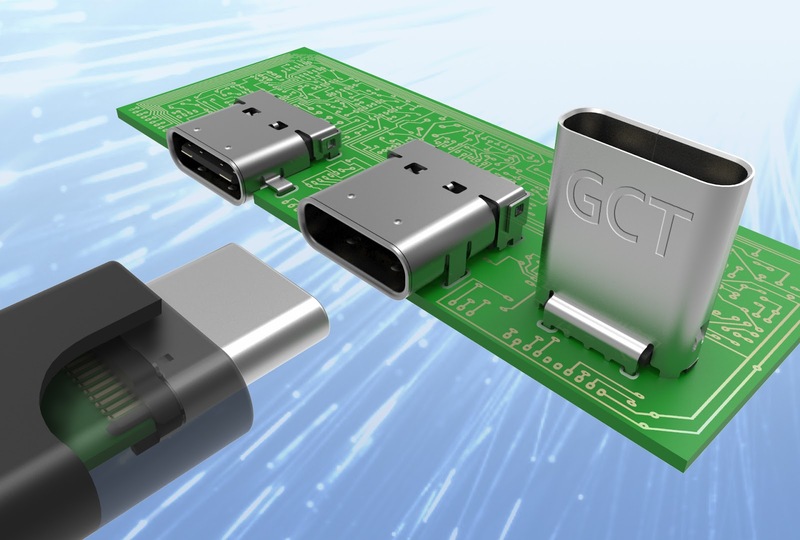 The march of USB Type-C continues as Hong Kong-based Global Connector Technology (GCT) launches a new range of high performance connectors for the standard, including power delivery. Designed for mobile and smart devices, the USB Type-C connector is ready for next generation applications delivering speeds up to 10 Gbps for data transfer, audio and video connectivity, supporting HDMi, DisplayPort and VGA. The connector also supports USB Power Delivery standards of charging capability, with rapid charging up to 100 W.
GCT’s range of five products includes both horizontal & vertical USB type C receptacles. Horizontal receptacles are available in a hybrid of thru hole and SMT, allowing higher co-planarity and ease of inspection after processing. Top mount, mid mount versions are available in short and long body types. GCT’s drawn metal shell design for horizontal parts provides superior electromagnetic interference (EMI) shielding compared to stamped sheet metal housings. The enhanced mechanical strength of the shell structure also makes GCT’s USB Type-C connectors suitable for the automotive, industrial, medical and instrumentation markets. “GCT’s new line of USB Type-C connectors offers significant performance advancement over previous USB standards, providing faster data rates, higher power, and A/V connectivity in one interface, as well as offering more design flexibility for engineers designing the next generation of electronics products,” said GCT Marketing Manager Laurence Hill. This month saw the last report of the international technology roadmap for semiconductors, the official publication that tracked the march of Moore's Law over the last 25 years. The final installment highlights the challenges over the next 15 years as the advances of silicon technology become more difficult to maintain. With 7nm systems being produced this year, that's still quite a long way to go, and there are major challenge such as extreme ultraviolet (EUV) that have still to be addressed. That is to to say its the end of the silicon business. If anything, the roll out of the Internet of Things and mass data centres demonstrates the longevity of silicon as the substrate of the modern world. Imagine what you could do in ten years' time with 7nm or 5nm silicon providing with billions of transistors for a dollar. Radio integration and power consumption will still be a major challenge. Data from the report highlights the need for a change. For example, it sees data centres having nearly 5m processor cores by 2021, doubling to over 10m by 2029, with significant increases in memory storage and networking performance and power consumption. But this may well start to be overtaken by photonics and quantum computing within that time. While the final ITRS report charts a path for existing technology research, additional research is needed for that transition to an even more connected world, enabled by innovations like IoT where it is the integration and co-existence of technologies that is the challenge rather than the sheer performance. Some of these technology challenges were outlined in a recent SIA-Semiconductor Research Corporation (SRC) report, “Rebooting the IT Revolution." “SIA appreciates the hard work, dedication, and expertise of those involved with the ITRS over the years and looks forward to continuing the industry’s work to strengthen semiconductor research and maintain the pipeline of semiconductor innovations that fuel the digital economy,” said Neuffer. Key learning points from the report will be on the Embedded blog in the coming days. The market for energy harvesting devices in the wireless sensor networks is expected to grow 19% a year by 2022 to reach $1576.9m. The data comes from a new report from Research & Markets that looks at the different sensor options such as temperature, pressure, flow, level, humidity, position and motion and infrared, as well as the different harvesting technologies such as light, vibration and thermal energy. All of this is being driven by the demand for safe and durable power sources and the increasing implementation of Internet of Things (IoT) for building automation. The report looks at building & home automation, industrial, transportation infrastructure, railways, aerospace, automotive, and security. The building and home automation segment is expected to hold the leading position by 2022 in the energy harvesting for wireless sensor network market. The growth of the building and home automation application is prominent in North America and Europe owing to the growing adoption of smart homes and also that of energy harvesting systems. The geographic segmentation categorizes the market on the basis of the main geographic regions into North America, Europe, Asia-Pacific (APAC), and Rest of the World (RoW). North America is expected to hold the leading position by 2022 owing to the growing building automation and smart home market in countries such as the U.S. and Canada. Europe has the second-highest rate of installation of wireless sensor network with energy harvesting systems in new building constructions and for industrial automation. The report includes coverage of key embedded technology companies such as ABB (Switzerland), Convergence Wireless (U.S.), Cymbet (U.S.), EnOcean (Germany), Fujitsu (Japan), Honeywell (U.S.), Microchip Technology (U.S.), STMicroelectronics (Switzerland), Cypress Semiconductor, Linear Technology (U.S.) and Lord Microstrain (U.S.). Unsurprisingly the ARM takeover by SoftBank has seen significant interest this week, and there will be more on this story in the coming days, but the interest in Microchip's new independent peripherals for its MIPS-based PIC32 continues to be a significant story. Facebook solving one of the key challenges in free space optics for its plans to provide Internet access from high altitude unmanned aircraft (design and built in the SouthWest UK!) has also been popular, while the impact of IoT continues to be felt in many different areas. This time it is the processing requirements in the data centre that are feeling the pressure, and software defined power is increasingly important as a key embedded technology to balance the load between servers in innovative ways. 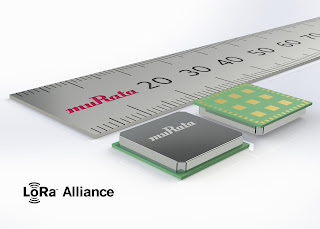 Murata has launched a a compact standalone module that can easily connect devices to the Internet of things (IoT) via a LoRaWAN low power sub-GHz network. The standalone compact module measures just 12.5 x 11.6 x 1.76 mm, is constructed in a metal shielded package and combines a Semtech SX1276 ultra long range spread spectrum wireless transceiver and an STMicro STM32L0 series ARM Cortex M0+ 32 bit microcontroller (MCU). An integrated TCXO that has robust low drift thermal characteristics provides an accurate clock source for the RF transceiver. Communication with the module can be achieved via UART, SPI, or I2C peripheral interfaces. An ADC and up to 18 GPIOs provide plenty of flexibility for connecting sensors, switches and status LEDs, and the module is powered from a 2.2 to 3.6 VDC supply. The module has pre-certified radio regulatory approvals for operating in the 868 and 915 MHz industrial, scientific and medical (ISM) spectrum in most geographical regions of the world, making it easy to add to a design. 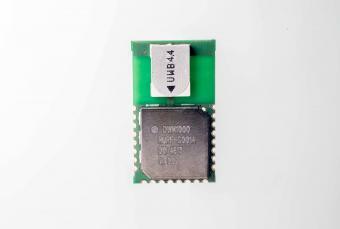 Typical applications include smart metering, wearables, tracking, M2M and internet of things (IoT) edge nodes as the module can operate from – 40 to + 85 degrees C.
The normal output power is + 14 dBm but a power amplifier (PA) boost function can be selected to increase RF output to + 20dBm for long range applications or those where the end-device is sited in a poor signal location indoors. The MCU includes 192 kB flash and 20 kB RAM, and has enough memory to embed customer applications and host other modulation stacks. In addition, an optional STSAFE secure element can be incorporated into the MCU to enhance the network security capabilities. "We're excited to welcome a leader in wireless modules such as Murata into the LoRa ecosystem," said Marc Pegulu, Vice President and General Manager of Semtech’s Wireless and Sensing Product Group. "Since Murata joined the LoRa Alliance, our teams have worked together to design a cost-effective, small form factor LoRaWAN module capable of supporting a wide range of sensors. We are confident Murata's new wireless module should help increase the adoption of the LoRaWAN platform worldwide, helping to make it the standard for LPWANs supporting low power IoT applications." Mass production of the CMWX1ZZABZ-078 module will commence in October 2016. Back in 2014, Facebook and Google were fighting to buy a UK company called Ascenta that was developing a high altitude unmanned aircraft that could be used to provide Internet access around the world as aerial basestations. While Facebook won that battle (Google bought Titan Aerospace instead), both face the challenge of maintaining high speed data links at 60,000ft, both to other aircraft and to the ground. Current 'free space optics' systems can be heavy and need to be steered to maintain a link. Now researchers at the Connectivity Lab have shown a new, passive approach that would work over long distances providing over 2Gbit/s of data, which is detailed at EETimes Europe. Instead of using optics to focus the light, the researchers have used plastic fibres doped with a fluorescent organic dye as the receptor. This can detect the light coming in from the free space link and convert it to a different frequency within the fibre. This signal can then be captured by a traditional high speed photomultiplier. This light collector features 126 sq cm of surface that can collect light from any direction, and, crucially, doesn’t need to be steered. This provides a lightweight, simpler receiver. “This approach has been used in luminescent concentrators for solar light harvesting, where the speed of the color conversion doesn’t matter. We showed that the same concept can be used for communication to circumvent pointing and tracking problems while accomplishing very high speeds," said Tobias Tiecke, who leads the research team. 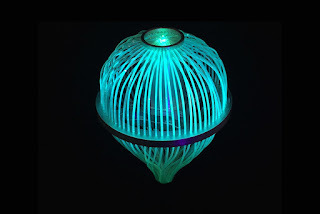 The initial system uses green and blue light, and the next challenge is to find materials that fluoresce in response to the near infra red light that would be coming from a laser on another aircraft or from the ground. Using ODFM modulation alongside near IR would boost the performance to 10Gbit/s, says Tiecke, which would be an elegant solution to the problem. Having tracked ARM and the embedded semiconductor since it started, today's £24bn takeover by Japanese services company Softbank didn't really make much sense. SoftBank says it believes ARM is one of the world’s leading technology companies, with strong capabilities in global semiconductor intellectual property and the “Internet of Things” (IoT), and a proven track record of innovation, which is very true. After all, ARM has successfully built a differentiated position as the world’s leading semiconductor intellectual property supplier, with a core competency in scalable, highly energy-efficient processors and related technology. Its technology is embedded in more than 95 per cent. of smart phones and over 30 per cent. of all chips with processors sold worldwide in 2015. Over 85 billion systems-on-chip have been shipped to date based on ARM’s technology. Yes, ARM-based chips dominate the mobile phone business and the company was an early starter in the IoT business through its low power and existing software development eco-system, and its security expertise will be increasingly important. But why was Softbank willing to pay 40% over the highest value ARM had ever seen (which was in March last year)? The ownership of the Sprint network in the US is seen as one factor now that it is showing signs of recovery, bundling cellular services with IoT equipment in the US, but is that enough? Not really. The key section of the deal document shows SoftBank’s deep industry expertise and global network of relationships will accelerate adoption of ARM’s intellectual property across existing and new markets. SoftBank intends to sustain ARM’s long-term focus on generating more value per device and driving licensing wins and future royalty streams in new growth categories, specifically “Enterprise and Embedded Intelligence”. So it is the enterprise, where Softbank has large and valuable contracts, that will be the focus, with more ARM-based systems being specified in the billions. All the data that is captured gives this high valuation, and Softbank's expertise is in handling that kind of business data. So the ARM devices are the on-ramp to the data highway (yes, that shows my age!) for Softbank. That's good news for ARM. The existing senior management team will stay in place, with funding to double the number of staff in the UK over the next five years, and increase staff in the rest of the world, which I would expect to be led by Japan following the joint venture announcement last with with Aeris, a pioneer in the IoT market. The joint venture, Aeris Japan K.K., will provide IoT and telematics services globally using the Aeris IoT platform. This is aimed at enterprise users, with the AerPort connectivity management platform, AerCloud applications enablement platform, AerCore IoT network and AerVoyance IoT analytics platform. With more than 7.5 million devices under management, Aeris is already one of the largest IoT service providers in the world, and the SoftBank deal provides the resources to expand into India, Europe and the United States, covering multiple market segments and offering a variety of services ranging from an IoT connectivity platform to IoT application middleware to complete IoT solutions for market segments including telematics in the automotive industry. Machina Research predicts IoT will account for one quarter of the global 41 million 5G connections in 2024. Japan and Korea will lead the charge and embedded factory-fit connected cars will be the biggest IoT application, according to Machina Research. Japan will lead the Asia-Pacific region’s market growth for industrial IoT, which is expected to be worth $54 billion by 2020, according to tech research firm Technavio. Aeris also delivers an end-to-end IoT technology platform, which enables faster time-to-market for enterprises. Security is a priority for Aeris, which offers enterprises and mobile network operators an end-to-end solution ranging from connectivity services to data analytics and applications, and early access to ARM's security technology such as TrustZone will boost is competitiveness. This also sees ARM's technology driving further into automotive telematics, as Aeris has a telematics solution for automotive original equipment manufacturers (OEMs) including a full suite of driver, dealer and OEM services. The great thing for ARM is that SoftBank doesn't compete with any of its semiconductor partners. But its probably not such good news for Renesas, which was the major competitor to ARM in Japan after having brought together the chip arms of Hitachi and Mitsubishi. In a major boost to the future of cellular connection for the Internet of Things, one of the most innovative chip suppliers is backing the new LTE-M and LTE-NB standards. Nordic Semiconductor is already a leading provider of ultra-low power wireless chips for stadnards such as Bluetooth with ten years of experience. It is developing a low power LTE technology for cellular IoT, recruiting an experienced group of cellular R&D engineers in Finland who were formerly employed by the Finnish arms of Nokia, Ericsson, Motorola, and Broadcom. Nordic expects to sample the first nRF91 Series solutions to selected lead customers second half of 2017, and it will be very interesting to see the design tradeoffs they make. Broad availability and production ramp will follow in 2018. Low power cellular IoT is positioning itself to be widely adopted in numerous markets and applications including, for example, smart utility metering, asset and people (e.g. child) tracking, fleet management, buildings security and safety, remote maintenance, smart vending machines, retail, healthcare and medical monitoring, real-time traffic monitoring, wearables, in-door and out-door GPS navigation, smart home technology, automotive (for customized insurance based on actual driving data), and industrial and agricultural automation. Nordic Semiconductor’s roadmap includes highly integrated chipsets and advanced software for the forthcoming 3GPP Release 13 LTE-M and NB-IoT cellular technologies. Highly optimized for power and size, the upcoming Nordic Semiconductor nRF91 Series is designed specifically to address the needs of emerging low power cellular IoT applications, including long battery life, low cost deployment and maintenance, scalability for potentially billions of devices, a miniaturized form-factor that can fit almost anywhere, and ubiquitous network coverage. LTE-M and NB-IoT are specified by the 3GPP to provide low power, secure, reliable, future-proofed, open standard and interoperable cellular connectivity for cost, size, and power-constrained IoT applications. The two technologies are set to drive breadth and growth for the emerging cellular IoT market projected to surpass 1.5 billion connections by 2021. Nordic expects broad coverage for the technologies in the 2018-2019 timeframe, with initial coverage starting in 2017. Complementing Nordic’s industry-leading product range and roadmap for short-range ULP wireless semiconductor technology, the expanded product roadmap for long-range, low power wireless is part of the company's strategy to target new high growth markets with its proven wireless connectivity and embedded processing technology, and extensive R&D expertise. I've championed open source hardware over the years (which tells you it has been tried quite a few times before) but the latest family of system-on-chip designs from SiFive looks somewhat like the re-birth of MIPS as an open source play. The Freedom family of SoC platforms launched by SiFive uses the free and open RISC-V architecture and ecosystem that its founders also developed at the University of California (sound familiar at all?). This, they say, will democratise access to custom, state-of-the-art semiconductors. The devices are being built on 28nm for a 64bit multicore Linix implementation, so not that state-of-the-art, or 180nm for the 32bit low cost IoT market with various peripherals. Hmmmm. The Freedom platforms (which unfortunately is reminiscent of Freedom Fries) comprise a complete software specification, board OS support packages (BSPs) which is good, development boards and base silicon. The platforms provide customers the ability to create their own silicon enhancements and customisations, which SiFive then quickly incorporates and delivers to the customer at a much lower cost and faster time-to-market than traditional custom silicon designs. 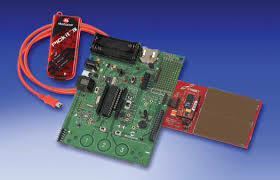 They say this also provides significant performance and power advantages over existing microcontrollers and FPGAs, which is true but also a benefit delivered by many other custom and semi-custom design houses. "The semiconductor industry is at an important crossroads. Moore's Law has ended, and the traditional economic model of chip building no longer works," said Yunsup Lee, co-founder of SiFive and one of the original creators of RISC-V. "Unless you have tens — if not hundreds — of millions of dollars, it is simply impossible for smaller system designers to get a modern, high-performance chip, much less one customized to their unique requirements." There's quite a lot of design houses that would contradict this - I write about many of them here (!) - but it gets the message out there. But what it does do it fragment the MIPS market even further than it is already. The founders say RISC-V was born from the dire need to address the skyrocketing cost of designing and manufacturing increasingly complex new chip architectures. SiFive's hardware designs make use of software and tools available from the open-source community under the guidance of the RISC-V Foundation, which reduces the cost of developing custom silicon. System designers can use the SiFive Freedom platforms to focus on their own differentiated processor without having the overhead of developing a modern SoC, fabric or software infrastructure. "RISC-V represents a bold new path for system designers in embedded and industrial markets," said Ted Speers, head of product architecture and planning for Microsemi Corporation's SoC business unit, which has produced some development boards for SiFive. "We went to SiFive not only because its co-founders created RISC-V, but also due to its team's agile methodology, which enabled the company to deliver a complete RISC-V sub-system and tool-chain targeting our secure, low power SmartFusion2 SoC FPGA platform on a very aggressive schedule." Freedom U500 Series with a fully Linux-capable embedded application processor with multicore RISC-V CPUs, running at a speed of 1.6 GHz or higher with support for accelerators and cache coherency. Designed in TSMC 28nm, the Freedom U500 platform targets initial customers in diverse markets such as machine learning, storage and networking. The Freedom U500 platform also supports standard high-speed peripherals including PCIe 3.0, USB 3.0, Gigabit Ethernet, and DDR3/DDR4. The Freedom E300 Series (above) is designed for embedded microcontroller, IoT and wearables markets. Designed in TSMC 180nm and architected to have minimal area and power, the Freedom E300 platform features the world's most efficient RISC-V cores with support for RISC-V compressed instructions, which have been shown to reduce code size by up to 30 percent. All this is very reminiscent of the MIPS roadmap, and under Imagination Technologies the architecture was available as open source. To give developers a head start on software development, full FPGA models of each SoC are available through SiFive so they can prototype their customisations in the form of custom RISC-V instructions, accelerators and co-processors. For more information, including how to purchase development boards with the Microsemi SmartFusion2 SoC FPGA, please visit dev.sifive.com. SiFive will showcase the Freedom family of SoC platforms during the RISC-V 4th Workshop in Boston on Tuesday, July 12. Altair Semiconductor, recently bought by Sony, has launched a new embedded chipset that will enable lower cost cellular connections for the Internet of Things (IoT). The dual-mode FourGee-1210 CAT-1/CAT-M chipset will be available later this year, enabling a smooth transition to the next standard of Cellular IoT networks through a software defined radio architecture. While CAT-1 chipsets have been deployed around the world for a wide range of IoT applications, both carriers and vendors have been pursuing the emerging CAT-M (CAT-M1) and NB-IoT (CAT-NB1) standards that offer extended coverage and battery life. Altair believes there will be a lengthy transition period until there exists sufficient coverage and standards maturity to enable complete conversion to CAT-M and NB-IoT and a CAT-1 option will be needed until the ecosystem is ready to fully adopt these standards. "Like any migration to a new cellular network, the complex transition from CAT-1 to CAT-M will take time and could potentially delay carrier and vendor rollouts," said Eran Eshed, Co-Founder and VP of Worldwide Sales and Marketing for Altair. "Altair's FourGee-1210 chipset will facilitate a smooth migration to CAT-M adoption, providing the ecosystem with the combined solution it needs for the next 18-24 months." The single receiver handles both CAT-1 and CAT-M with a seamless switchover and low bill-of-materials cost, as well as low power consumption. Altair has also built in a Software Defined Radio (SDR) feature to allow over-the-air firmware upgrades (FOTA) to accommodate new versions of the CAT-M standard. The FourGee-1210 chipset will reach the market by the end of 2016 alongside the projected launch of the first CAT-M networks.
. Is your smart grid secured?